The process of cheese making has changed little in the centuries since mankind first discovered the alchemy of changing milk into cheese. Although modern machinery makes commercial production easier, artisan cheeses maintain the tradition of hand-forming delicious cheeses such as queso blanco or mozzarella. 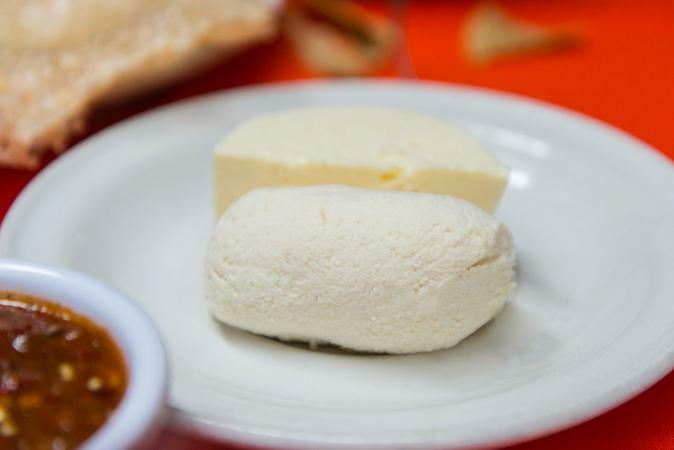 Queso blanco ("white cheese") or queso fresco ("fresh cheese") is the simplest cheese to make. While many types are made with rennet, which is an enzyme taken from the lining of a calves' stomach, queso blanco is made with acid. 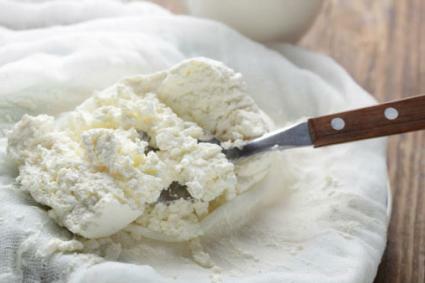 The acid coagulates the protein in the milk, making clumps, or curds, that create the cheese. You can use cow's milk, sheep's milk, or goat's milk cheese for this easy recipe. Put the milk in a saucepan and place it over medium low heat. 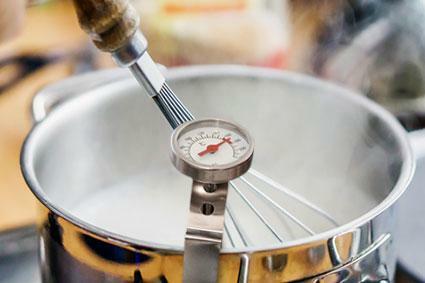 Clip a food thermometer to the side of the pan, making sure it doesn't touch the bottom. Heat the milk to 170 to 180°F, stirring constantly. The milk should not boil, but little bubbles will form around the edge and it will steam. Remove the pan from the heat and add the lemon juice, lime juice, or vinegar. Stir the mixture briefly, then let the pan stand off the heat without moving it for 40 to 50 minutes. Meanwhile, line a strainer or colander with a double layer of cheesecloth and put it over a bowl. The milk will form into curds, which are soft pieces of protein. Spoon the curds into the cheesecloth lined strainer. Let stand for another 30 minutes. Drain the bowl underneath the strainer. Add the salt and stir the curds gently with a wooden spoon. Gather the cheesecloth edges around the curds and tie with kitchen string. Let the cheese drain over the bowl in the refrigerator for another hour. At this point, you can just spoon the cheese into a bowl, cover it, and refrigerate it to eat as-is. Or you can make a firmer cheese by pressing it. To press the cheese, put the cheesecloth bundle in a smaller colander over another bowl. Top with a plate, then a weight such as a can of vegetables. Refrigerate for 1 to 2 hours longer, then unwrap the cheese, put it into a bowl, cover tightly, and return to the fridge. Depending on the milk you use, the cheese will either be mild or have a more pungent flavor. Sheep's milk makes a tangy cheese, while cow's milk cheese will be mild and sweet. You may need to add another tablespoon or so of lemon juice or vinegar to get curds to form. Add slowly, stirring the mixture, until the milk starts to clump. To use this cheese, sprinkle it on burritos or chili. It's also delicious as a stuffing for jalapenos or poblano chiles. You can also use it to make delicious quesadillas with flour or corn tortillas. Save the liquid, or whey, that drains from the curds. It's delicious in soups and smoothies. Once you have successfully made an acid-based cheese, you can try your hand at other varieties. There are several cheeses made without rennet, such as cottage cheese and cream cheese, and you can find vegetarian rennet too. The rennet used most often today is called fermentation produced chymosin or FPC. This compound is made with fungi. Goat milk cheese: This recipe uses liquid rennet and mesophilic starter to make a tangy and pungent soft cheese. Feta cheese: Feta has a sharp flavor and crumbly texture. It is made with rennet, yogurt, and salt. Mozzarella cheese: This classic pizza cheese is fun to make. This recipe uses citric acid to help the milk proteins coagulate. Organic whole milk cottage cheese: Your own homemade cottage cheese will taste better than anything you can buy in a store. Because of concerns about bacteria, the majority of cheeses today are made from pasteurized milk. Some hand made cheese may be made from unpasteurized milk. Typically, the bacterial starter culture and ripening process make such cheese safe to eat, but if you're concerned at all, just avoid cheese made from unpasteurized or raw milk, and stick with pasteurized cheese. It shouldn't affect the flavor much. To get the best flavor from your favorite cheese, you should allow it to warm up slightly before serving. The easiest and best way is to leave it wrapped on the countertop for 20-30 minutes prior to serving, then enjoy!